This pin isn't a super glitzy piece. It just has a few orange rhinestones that are centers to the yellow enamel flowers but don't they showcase the piece beautifully? The pin really appeals to me. I love the combination of yellow and orange and the depth and dimension of the design is really special. 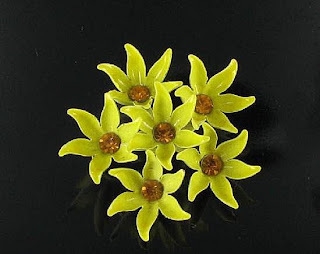 It is not often that one finds older enamel flower jewelry in such good condition. Someone took special care storing this beauty. 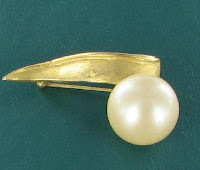 The brooch has a white riveted back setting and is 1 3/4" with a 1/2" dome and rounded V clasp closure. It is from the 1950s but would look spectacular with this summer's fashions. Yellow has been a strong fashion choice all summer long this year. 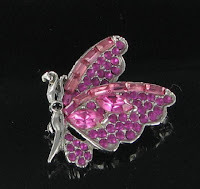 The pin is available from my Ruby Lane Shop - Finishing Touch Vintage Jewelry for only $22. Pavé is the process of setting stones (notably rhinestones) in which a number of small stones are set as closely together as possible. The word is taken from the French and is pronounced pa - vay. Often better pieces will use a claw setting. For less expensive pieces, the stones are simply glued in. The end result is what looks like a continuous surface of diamonds or other gems. Pavé is a word that is often misused. So much so, in fact, that the word has incorrectly become nearly a ‘generic’ description of any piece of jewelry with a lot of rhinestones. The original French word meant paving, in a similar manner to paving a street. If you think of this meaning, it will help to get a better picture of pave settings in your mind. The jewelry piece should be literally "paved" with stones or rhinestones, with as little metal as possible showing. The word is also often used for a strip in a setting which is done in this same style. The strip will look like a little paved street, and is used as an accent, rather than covering the whole piece of jewelry. In pavé, each of the stones each has their own little holding area the shape of the stone. The holding areas are just very close together. Here are a few examples of pavé jewelry. You can click the pictures to open a larger image. 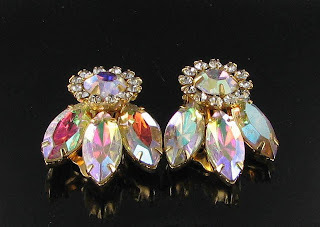 This week's vintage jewelry find is a pair of fabulous Juliana Style earrings with Aurora Borealis Rhinestones. The earrings have many of the elements of D & E Juliana designs but, alas, were not verified by the Juliana verification site. Still lovely and so full of sparkle and fire. The earrings are set in goldtone metal and have a layered design with prong set aurora borealis rhinestones which rise to a large single aurora borelais center chaton which is surrounded by smaller AB stones. So pretty and fantastic condition of the AB rhinestones. The size is 3/4 x 1". They are in gently used very fine condition. 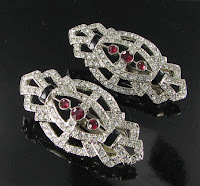 For details and more pictures, you can view these Juliana Style rhinestone earrings in my Finishing Touch Vintage Jewelry store. The price is $30. Today's featured vintage jewelry designer is Emmons. Most collectors of vintage jewelry know the name Sarah Coventry, but many do not know that the Sarah Coventry line was only one line developed by Charles H. Stuart. The company was located in New York City and did business until 1981, at which time it closed its doors for the last time. The early representatives for the company were all men, but by the 1950s women were mainly showing the lines to prospective customers with the home party plan. The Emmons designs were very well made, good looking and, while more expensive than Sarah Coventry designs, still easy on the pocket book. Often a design was made in matching pieces - brooches, earrings, necklaces, rings and bracelets. Full parures are much harder to find now than single pieces. The pieces in the line were all marked with a design name. Emmons pieces were plentiful at the time, but are harder to find now than the Sarah Coventry pieces. It is considered a medium range design name. Emmons jewelry seems to me to have a higher value than the Sarah Coventry pieces do. There is no need to purchase pieces with damage. Choose those that you like, and choose pieces in good condition. This blog post is another in my series about choosing jewelry suitable for individual star signs. Today's astrological sign is Virgo, which is the sign for those born between August 23-Septempber 22. The sign is depicted as a Virgin and it is an earth sign. The ruling planet is Mercury. Those born under the sign of the Virgo are said to be shy and modest. They are methodical, and analyze every aspect before making a decision. They are practical in matters concerning money. On the negative side, it is thought that they can be too analytical and too perfectionist. They tend to worry too much, even about trivial matters. This is the sun sign that likes all their ducks in a row! Thinking about buying jewelry for your Virgo friend and don't know where to start? Let's examine some of these zodiac facts for a bit of inspiration. This pretty set of interchangable flower pins by contemporary designer Joan Rivers would appeal to the small flower lover in her and the color blue as well. This pretty necklace by Sarah Coventry is called Park Avenue and features a navy blue curved front to it, which is the lucky color for Virgos. What would your Virgo friend like for a gift? I've talked a lot about cleaning sterling silver jewelry in past blogs and given many suggestions about how to go about this process. Readers of my blogs know that I am not a fan of sterling silver dips, since they can be harmful to the finish of silver pieces. Often, I will suggest just wiping a piece with a Sunshine cloth. 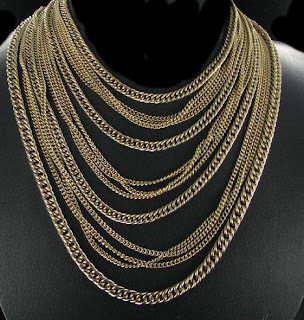 But if you have tried this with a chain necklace, you will know that these can be very hard items from which to remove the tarnish because of the small links involved in the making of the chain. I found a YouTube video which deals with just this situation. The maker of the video gives a step by step demo of how to go about it. Basically, the cleaning involves baking soda and boiling water in a metal pan. Sterling dips use the same process, but this gets the job done without the harmful chemicals and baking soda is much cheaper to use than the store bought dips. Since 1990, Joan Rivers has been using having fabulous fashion jewelry created which bears her name. She is intricately involved in the design process and insists on the highest quality standards. Her range is called "Modern Classics" and it transcends trends to become jewelry pieces that you can wear anytime. 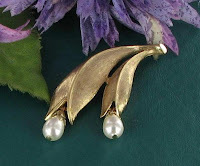 I have several of her styles on my Vintage Jewelry Lane website and the quality of them is, indeed, very high. The piece pictured here is a lovely foiled art glass brooch in vibrant green with a brass setting. 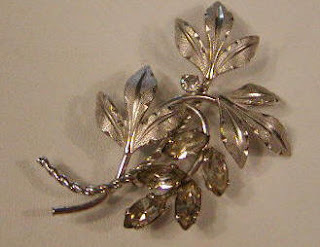 It features a long sprig design with a cluster of very pale green rhinestones and pave rhinestones in swirled tendrils. The outer tendrils feature prong set dark brown (look somehwat black in the pictures but are brown) marquis glass rhinestones and gorgeous green and black foiled art glass cabochons. The setting is a japanned brass finish. The size of the brooch is 3 1/2 x 1 5/8". The pin has never been worn. It is marked Joan Rivers - China on the back. Price is $49.99. To view styles and for more details on this piece, please visit the Joan Rivers jewelry section of the contemporary jewelry part of the website. It's mid summer and thoughts tend to go to beach related themes. 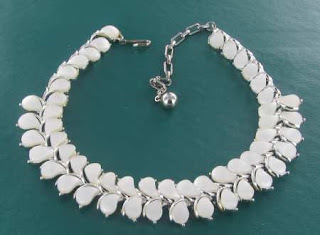 I was thinking about all the possibilities of nautical and seashell type jewelry and went searching on google to see what I could come up with. A lot of seashell type jewelry that I've come across is the sort of jewelry sold in beach town souvenir shops. Nothing to write home about, so I wondered what other possibilities there are out there. I found an interesting beading blog that had a post about the different types of shells used in jewelry making. The writer of the blog has an overview of the various types and pictures of each one. The shell featured here is called a "hammer shell" also known as a violet oyster. I love the streaked color and the rippled figure. Imagine using this to make a pendant necklace? It would be just stunning. For more photos and a description of each style, you can read the whole article on seashell jewelry here. 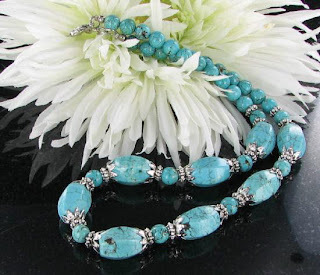 Collectors of vintage jewelry may be familiar with the name Carole Tannenbaum. Carole is a high-profile personality in the worlds of costume jewelry and fashion, and is one of North America’s foremost collectors of vintage costume jewelry. Her pieces have been featured in more than forty international venues, including Bergdorf Goodman, Neiman Marcus, and Barneys. They have also been showcased in exhibitions in museums that include New York’s Metropolitan Museum of Art. 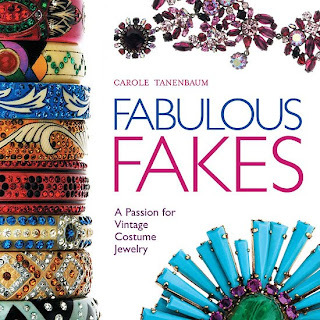 Carole is the author of the book called "Fabulous Fakes," which gives you details of one hundred years of the most amazing pieces of costume jewelry ever produced, in brilliant and beautiful color. It tells their story, starting with mass-produced Victorian jewelry, moving through the wonderfully sophisticated lines of art deco geometrics, and ending with 1990s designer and artisanal jewelry. The Collector's Weekly recently interviewed Ms. Tannenbaum, and the discussion is very interesting and filled with rich details of some noted high designers such as Coco Chanel, Schreiner, and Coppola e Toppo. She also discusses bakelite vintage jewelry, and talks about her collecting tastes and how she amassed the vintage jewelry collection that sheshe owns. The Carole Tannenbaum interview is very comprehensive and you can view the whole transcript of it on the Collector's Weekly site. It's quite extensive and well worth the read. Bakelite is an early vintage thermoset plastic made from phenol formaldehyde. It has fillers to make it durable, strong and relatively inexpensive to manufacture. The material is a US manufactured product, patented in 1907 by a Belgian chemist, Dr. Leo Hendrik Baekeland, who worked in New York. Bakelite was first manufactured between 1907 and 1927. Early uses of Bakelite were radios, handles for pots and pans, castings for televisions, toys, etc. It was later used in the manufacture of jewelry. 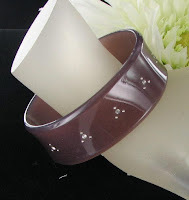 Bakelite jewelry has become a hot collecting area in the last several decades. Genuine bakelite jewelry commands very high prices. It should not be confused with French Bakelite or "fakelite," which is a modern mass produced material made to look like bakelite. Some bakelite material is translucent and looks somewhat like lucite. 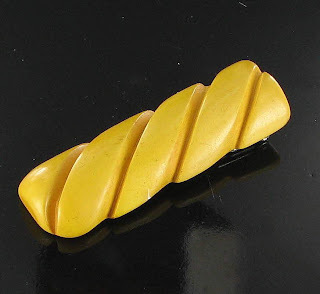 Other examples of it are quite dense, like the bakelite dress clip featured here. Once you have handled some, it becomes much easier to determine whether the piece you have is actually bakelite or plastic. 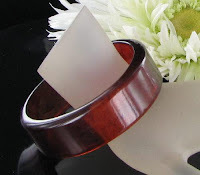 There are many ways to determine whether the piece that you have is genuine bakelite. 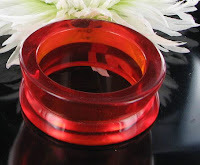 For more information about Bakelite and how to test jewelry for its content, please go to the bakelite testing information page in my resource library at Vintage Jewelry Lane. 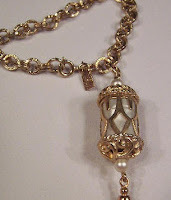 This week's vintage jewelry find is a stunning necklace made by Trifari. The necklace has a very feminine and romantic style to it and features tear shaped pink glass stones with aurora borealis rhinestone accents. This pretty necklace has a wearable length of approximately 16-17" and is 5/8" wide. 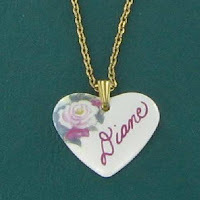 It is signed on the back of the necklace with the design mark Trifari TM. Make this stunning pink glass Trifari necklace yours today for only $42.99. Hurry though. I only have one of them. I don't seem to be able to keep big chunky bracelets in my store for long. I listed this one in my Ruby Lane shop the other day and it sold within about 15 minutes. That has to be a record! Big bracelets like this are so funky and fun to wear. I've even seen some runway photos were the current trend is to combine more than one for an even bigger look. It appears that bigger is better when it comes to this style of bracelet. 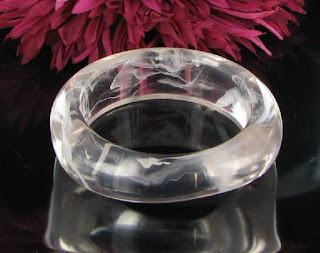 This style of bracelet comes in a wide variety of materials, from plastic or lucite styles to goldtone or silvertone metal all the way through to bakelite or other vintage plastics. Here are some to choose from. 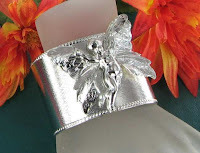 Prices range from $11.99 for the cute fairy cuff style to $95.99 for the bakelite style. Just click the pictures for more details. Sterling silver has been used for generations to mark historical occasions, to celebrate special achievements, and to produce jewelry that is long lasting, and develops a wonderful patina with age. It is synonymous with classic simplicity and style in the world of fashion. Throughout the ages, people have been captivated by the lovely white metal known as sterling silver. Those who collect vintage jewelry know that sterling silver jewelry is a very popular collecting medium, but silver jewelry can be marked in a wide variety of ways and much of it is not marked at all. What exactly determines whether a piece can be called sterling silver? How should it be marked? Hopefully, this article will answer a few of your questions. Sterling silver is an alloy. It is typically made from 92.5% silver and 7.5% copper, although other compositions are possible. Sterling silver is very versatile and flexible, and this makes it a useful addition to any wardrobe. With the addition of precious stones and other precious metals, it lends itself to even an even greater scope of style and fashion. Silver jewelry it not normally pure. It is very soft when pure, so it has other alloys added to it to make it more durable. The addition of copper makes the jewelry piece much more likely to tarnish. 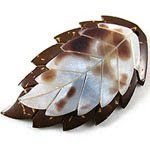 This tarnish, also called oxidation or patina, is a darkening which occurs when the sterling silver reacts with gases in the air or moisture and humidity. The more humid the climate, the more likely a piece of silver jewelry is to tarnish. Sterling silver jewelry that is worn regularly is less likely to tarnish that that which is stored for long periods of time. Many collectors of sterling silver jewelry like the patina that sterling aquires as it ages, so it is often purchased this way and the cleaning or polishing is left up to the new owner. 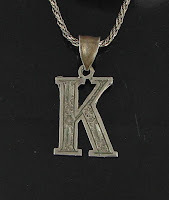 Sterling silver jewelry can be marked in many different ways. It is often marked with the word sterling, or 925 and sometimes will also have the identifying country, i.e. 925 Italy or Siam Sterling. Sterling silver is widely used for jewelry manufacture because of it's malleability and relatively low cost to produce. If it was made in Mexico, it will often have the country name and 925 as well as a region, such as JM2 925 Mexico TM - 03. 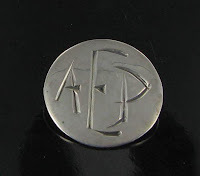 In this case, the TM is the region and the 03 signifies that this is the third silversmith to register the mark for the region. Sterling silver jewelry can also often be found with a vermeil finish. Pronounced "vermay," this is a French word which describes sterling silver that has been electroplated with at least 100 millionths of an inch of karat gold. The gold vermeil wash will help to minimize the tarnishing of the silver, but I've seen older pieces marked as gold over sterling that still show a fair amount of patina. Silver is an element which occurs naturally in the earth. 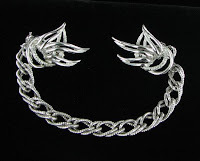 Fine silver is 99.9% pure, but is much too soft and malleable for jewelry manufacture. The extra metal, usually copper, is added for additional hardness. Mexico is a huge manufacturer of silver jewelry. The content of Mexican silver is more pure than sterling silver, and is usually 95% silver and 5% copper. It is often also marked with the district in Mexico from which it originates, i.e. Taxco Mexico silver. There is an alloy known as Alpaca Silver. This is not true silver. It is an alloy that is made of approximately 60% copper, 20% nickel and 20% zinc, with 5 % tin. It is often used as a substitute for silver and is found in many Mexican designs. This alloy is also sometimes referred to as German Silver. 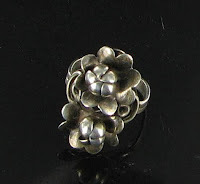 Many pieces of Scandinavian silver jewelry bear the hallmark 830 S. This indicates that the jewelry is silver - but it is 830 parts silver out of 1000, not 925/1000 as sterling silver is. It is still very collectible but should be called silver, not sterling silver for accuracy. The US Federal Trade Commission (FTC) has stipulated that jewelry which is sold in the USA may not be marked as silver, solid silver, sterling, or sterling silvery, and cannot use the abbreviation ster, unless it contains at least 92.5% pure silver. Sterling silver jewelry pieces shown in this article are available in my online stores. Just click the pictures for more details. Also be sure to check back soon, when I will talk about how to care for, store and clean sterling silver. 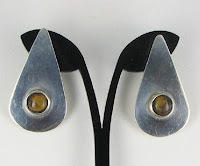 Today's featured vintage jewelry designer is Kramer. This designer is always at the top of the lists of vintage jewelry collectors. Their pieces are well made and truly stand the test of time. The company was founded in 1943 in New York by Louis Kramer under the name Kramer Jewelry Creations. The continued making jewelry thoughout the peak years of the 1950s and 60s and finally closed their doors in 1979-80. Louis was joined by his two brothers Morris and Harry as the company grew and their designs became more and more popular, but Louis is credited with the design of the superior Kramer Jewelry. Kramer made us of unique and rare specialty stones and beads in his designs. 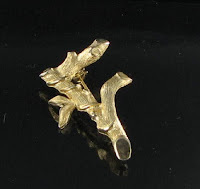 They also made a wide range of figural jewelry and whimsical pins, like many other designers of the times. During the 1950s and 60s, Kramer made jewelry for Christian Dior. 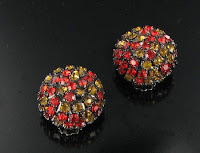 These designs often had good quality rhinestones with large center focal stones. These Kramer/Dior pieces are very collectible and much sought after. The 1950s marked the introduction of Kramer's "Golden Look." These pieces were simple designs which were made to go with the tailored look of the times. The quality was so good, it was hard to tell them from real gold. Later, during the 1960s, they introduced the "Diamond Look" which was meant to stimulate real diamonds. The 1960s also saw the introduction of their ear covers. These ear covers had a curved wire which tucked behind the top part of the ear and the earring covered the whole ear and was worn with upset hairdos. 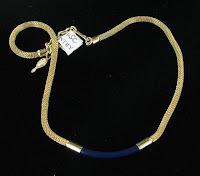 Since the company focused on glamorous jewelry, the natural look in jewelry which was introduced in the 1970s hit Kramer Jewelry hard and it closed its doors in the late 1970s. Higher end Kramer pieces, such as full parures made from the finest rhinestones are the pieces that have risen the most in value. Many top Kramer parures will easily fetch $100-$250 or more today. The designs are top quality and have withstood the passage of time, so the pieces will continue to rise in value. As always, buy the designs that you personally like and be sure to get pieces in top notch condition. Extras such as original boxes or paper hang tags always add to the value of any Kramer jewelry. Both jewelry pieces shown are available for sale. The Kramer multi strand chain necklace can be found in my Ruby Lane Shop for $40 and the Kramer white thermoset necklace is found on Vintage Jewelry Lane for $32.99. You can click the pictures for more details. My goodness, it's August already! This year has just flown by for me. Since it's a new month, it's time to talk about the birthstone for August - the Peridot. This lovely gemstone is a semi-precious gemstone that is usually found in wonderful hues of translucent greens. It is the official birthstone for the month of August and is also considered the gemstone for the 3rd and 16th anniversaries as well as the stone for the Zodiac Sign Libra. 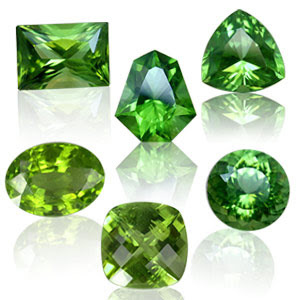 This gemstones is one of the few that comes in basically one color - green. There are varying shades from yellow green through to brownish green. The most valuable color is a dark olive green. Peridot has been prized by royalty for thousands of years. It was used in jewelry as far back as the ancient Egyptians. It has been mined in numerous locations around the world, but the modern Egyptians have maintained a fondness for this gemstone into modern times. In fact, it is considered by many to be the national gemstone of Egypt. As with all gemstones, Peridot has some specific healing powers attributed to it. It is thought to clear the heart chakra. It also strengthens breathing, promotes prosperity, growth, and openness. It was used by Egyptians, Aztecs, and Incas to gently cleanse and heal the physical heart. Yellower gems also aid in problems of the stomach, liver and adrenal glands. The emotional qualities attributed to peridot are that it helps wearers understand relationships, and other realities, alleviates depression, anger, fear, jealousy and anxiety. This lovely Georgian poem about the birthstone for this month couples peridot with love and relationships. 'Tis said, must live unloved; alone. Just a quick blog post today. I spent a great deal of my free time this past weekend updating the vintage jewelry glossary in my resource center on Vintage Jewelry Lane. I have added dozens of new terms to the list. Many of them are fairly obscure words that aren't heard as often which may stump even veteran vintage jewelry collectors. Don't know what Basse-taille means? Haven't got a clue what someone is talking about when they say blister pearl? Totally dumbfounded when you hear the word cannetille? All of these words and many more are defined for you in the glossary. Armed with this resource and a good memory, you'll be able to join in with the most advanced vintage jewelry discussion with confidence. They say a picture is worth a thousand words. In this technological time of ours, one might add that a video can tell the story best. I get questions all the time about how to recognize pieces from certain eras. This can be a daunting puzzle for many. Not to worry though. If Art Nouveau or Arts and Crafts era is one of your hard to determine time periods for vintage jewelry, I've found a YouTube video that you may enjoy. The video is made of several parts but the first part of it is the one that I found most interesting. 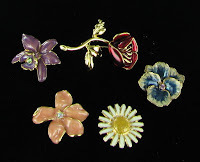 It is an interview of a lady who has been collecting Art Nouveau pins since she was a teenager. 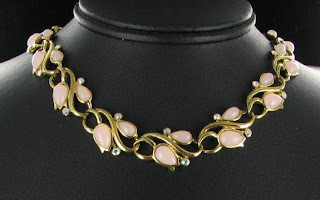 She discusses the various styles of Art Nouveau jewelry and has examples of many pieces which clearly show the style. After this part of the video, (and an inserted commercial!) she has an interesting demonstration of a new use for vintage brooches - to decorate a plain black clutch bag that she got on ebay. With a few brooches and one bag you can do the same and have so many different purses that will go with a variety of different wardrobe choices. Get a cup of coffee and enjoy. It's worth the watch. Buying jewelry as gifts can be a little difficult at times. Will it be their taste? Will they like the color and style? Sometimes, it seems as though the choices are enormous and one never seems to know just what to pick. Here is a gift idea - Monogram Jewelry. This style of jewelry comes in all types - necklaces, earrings, bracelets and pins. You can choose the first initial of the person's name, the full monogram with all names or, in some cases, even the whole name spelled out. Some of the pieces of monogram jewelry are done in plain goldtone or silvertone metal and some are jazzed up with rhinestone or enamel accenting. There is sure to be something for all styles and tastes. A special type of monogram jewelry features pieces with the word mother, madre, or mom spelled out. 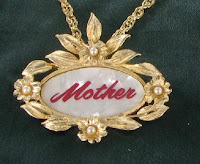 This would make a great gift for your mother. 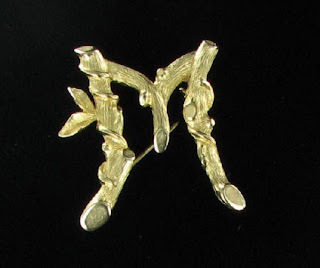 Most vintage jewelry designers made monogram jewelry. Sarah Coventry has a whole line called "Sarah's ABCs" which is very popular with collectors. 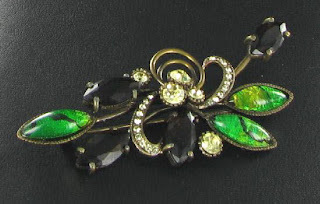 Here are a few choices, or you can visit the links above to see the whole selection at my Vintage Jewelry Mall or Carolina Collections stores. Click the pictures for more information. Prices range from $6.75 to $15.99. Be quick. This type of jewelry sells out fast and I only have one of each piece.